If you are looking for information on the Speedy Towing franchise business opportunity, Speedy Towing franchises or Speedy Towing franchising, then you have come to the right place. At Speedy Towing, we believe in providing fast, safe and professional towing services at the most reasonable prices possible. 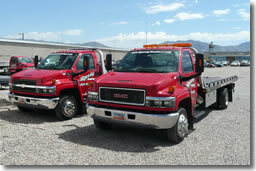 We employ only the finest skilled towing professionals and spare no expense on safety and training. All of our drivers are wreckmaster certified and approved by law enforcement for accident towing and state impounds. Caring dispatchers are there to answer customer calls day or night. 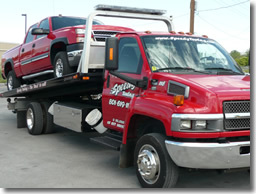 Speedy Towing is pulling up the standards in the towing industry. Our high level of professionalism places us a cut above our competitors, with features that include clean, well maintained, newer towing equipment; a well trained, uniformed staff; and efficient, courteous service. A positive attitude, a willingness to work hard, and an unrelenting determination to succeed, is what will make your franchise a success. Everything else can be taught. 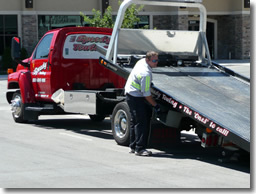 Speedy Towing is a low risk opportunity. The success rate with a franchise is much higher than going it alone. Proven system of operation. We have already experienced the expensive "learning curve". Training. You receive 2 weeks of training at our headquarters and 1 week at your location. Less capital. You can start from a home office to minimize expenses and maximize profits. Location assistance. We can help you find an office and an impound yard. Networking and support. The ability to have questions answered from the corporate franchisor and fellow franchisees is a HUGE advantage. National and local advertising. Assistance on advertising with promotional products and printed materials, and a website with your local info. Turnkey business. We can have you up and running quickly. Collective buying power. From software to tow truck insurance, we can negotiate better rates and products. Operating manual. Our comprehensive manual contains our trade secrets and procedures to help ensure a successful business. Planning and forecasting assistance. We assist you on growing the business and offer advice on equipment and office personnel. Financial/Accounting systems. Keeping track of income and expenses is easy with our towing software and Quickbooks. Ongoing support and consulting. Field manager support via phone, email and on-site visits as well as ongoing training classes, intranet and networking. Financing. We can help you find financing for trucks and equipment. Sales and marketing techniques. We not only teach you the techniques, we'll help you understand how and why they work.